Crowds flock to Ink to indulge their appetites and their imaginations. 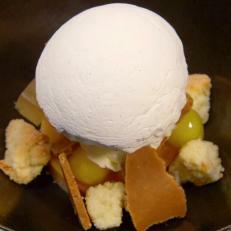 Chef-Owner Michael Voltaggio delights his diners with an innovative, ever-evolving menu that he describes as “modern Los Angeles.” His culinary wizardry shines through in favorites such as an apple dessert. Creme caramel serves as the base of this artful treat, which comes adorned with apples, shortbread bits and buttery fragments of pie dough, along with a scoop of semifreddo that’s infused with the flavor of burnt applewood.